. With both Reactions and better commenting, we aim to make it easier for you to get the response and adoration you deserve. Try Reactions now! We hope your reaction is <3. Updated, 2:30 PM: Corrected to say that Reactions is a Layouts-only feature. One of our goals at Blogger is to make it easy for authors to get feedback on their content; we believe that authors are driven in part by the reactions and criticisms offered by their readers, and that these interactions enhance the quality of blog content. In support of this effort, we're launching Reactions, simple annotations chosen by authors and given by readers. With Reactions, readers can easily respond with one click, increasing feedback on posts. To enable Reactions, log in to your dashboard, go to Layout > Page Elements and click the Edit link in the Blog Posts element to open the blog post configuration tool. 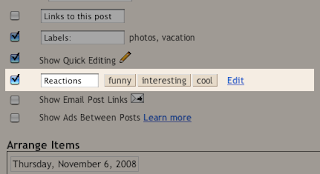 Then, check the box next to Reactions, edit your reactions as a comma-separated list, and click Save. Reactions works with Layouts templates, though if your template is heavily customized, you may have to reset your widget templates for Reactions to appear. If you have a Classic template you will need to switch to Layouts to use Reactions. Of course, Reactions isn't the only way to gather great feedback from readers; we also recently launched the Embedded Comment Form. With both Reactions and better commenting, we aim to make it easier for you to get the response and adoration you deserve. Here at Blogger we’re always working to make the site and your blogs faster and more reliable. 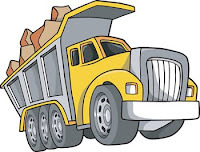 We want you to think of us as a big truck: able to handle anything you can dump on us. Tuesday’s election was a good chance to see just how big a truck Blogger actually is, and we’re happy to report that Blogger-hosted blogs, for the most part, held up under the record-setting traffic. That being said, there were definitely some hiccups (potholes?) along the way. Our favorite political and polling analysis blog, FiveThirtyEight.com, received an order of magnitude more visitors than the next most visited blog. 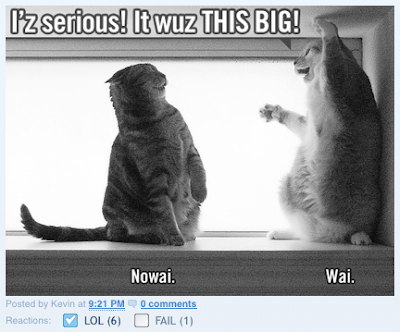 They also received more than 50 times as many comments as the next most commented-on blog. Unfortunately, this traffic caused some publishing delays for Nate and Sean as well as some intermittent slowness on their site. After we got word of the trouble, we were able to shift some resources around to keep things running fairly smoothly for the rest of the night. Now that traffic has calmed down, our engineers are hard at work tuning and improving Blogger based on the experience. We’d like to thank bloggers, commenters, and readers for participating in one of the biggest blogging events ever. Your voices validate what we do, and every day we look forward to making Blogger faster and better for you.